Media damaged from water, smoke, or fire or otherwise physically damaged media. Accidentally erased or over-written data cartridges. data from malfunctioning tape back up drive. Convert UNIX storage formats to Windows NT formats Convert EBCDIC and other formats to ASCII. Convert COBOL to ASCII. Travan 1, Travan 2, Travan 3, Travan 4, Travan 5. Ditto Max 3GB, Ditto Max 5GB, Ditto Max 7GB, Ditto Max 10GB. LTO Ultrium Tapes DLT Tapes (DLT 260, DLT 600, DLT 2000, DLT 2000XT, DLT 4000, DLT 7000, DLT 8000, DLT 1, SDLT 220) 8mm DAT (8200, 8200C, 8200XL, 8500, 8500C, 8500XL, Mammoth-LT, Mammoth, Mammoth-2). 8mm AIT Tapes 4mm DAT (DDS, DDS-DC, DDS-2, DDS-3, DDS-4). SyQuest Cartridges ¼" Cartridge (QIC Mini format) (DC 2000, DC 2060, DC 2080, DC 2120, DC 2120XL, DC 2120EX. MC 3000, MC 3020, MC 3080, MC 3080 Wide, MC 3095 Wide. Aiwa Bolt 6.6 GB, Aiwa Bolt 10GB. Bernoulli Drives WORM Media CompactFlash Media. CD and DVD Data Recovery: Data Recovery AID can recover lost files on all types of CD-ROM, CD-RW, DVD and Mini Discs. CD-ROMS,DVD or Mini Discs that are unreadable or unrecognizable. Improperly closed out discs. (stoped before burning was complete). Ticking, whirling or scraping sounds coming from the disc drive. Scratched,water damaged and even some cracked or broken disks. Digital Photo Recovery: If digital images or photos are deleted, formatted or have damaged image files, UniRecovery is capable to recover all types of compact flash memory cards, photos or digital files such as: BMP, JPG, JPEG, TIFF, PNG, GIFF, MP3, WAV, MPEG, MPG,AVI. UniRecovery guarantees to recover all recoverable files. CF Compact Flash Type I Card,CF Compact Flash Type II Card. MMC I Multi Media Type I Card, MMC II Multi Media Type II Card, RS-MMC Reduced Size Multi Media Card. SD Secure Digital Card, Mini SD Mini Secure Digital Card. MS Memory Stick Card, MS DUO Memory Stick Duo Card, MS PRO Memory Stick PRO Card, MS PRO DUO Memory Stick PRO Duo Card, MS Memory Stick Card MagicGate, MS DUO Memory Stick Duo Card MagicGate, MS PRO Memory Stick PRO Card MagicGate, MS PRO DUO Memory Stick PRO Duo Card MagicGate, MicroDrive Card and TFlash Memory Cards. Any compact flash or memory stick made by the manufacturer. Provides Selective Scan for various file formats. Provides thumbnail view and Enlarged view of images that can be recovered. Provides" Event Log" of the recovery process. Provides a preview of Audio and Video files that can be recovered. As a single speck of dust entering a hard disk could cause fatal results. It is larger than the distance between the read/write heads and the platter in a hard disk (40 microns, a human hair being 100 microns thick) and its collision with the Hard Disk head would be extremely detrimental. Our advanced laboratories are equipped with Clean Rooms rated as ‘Class 1000, 100 & 10 ’ where there exists no more than 1000 particles; and ‘Class 100’ where there exists no more than 100 particles whereas with "Class 10", less than 10 particles of 0,5 µm found in our Cabim-Flow which is of "Class 10". 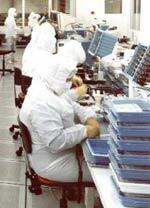 The air quality of the Clean Rooms complies with the applicable standards BS 5295, ISO 14644-4 and Federal Standard 209. Hard disk fabrication requires a ‘Class 100’ Clean Room and UniRecovery undertake all laptop hard drive recovery work in Clean Rooms ‘Class 10’. Commonly established, recovery from “Clicking” hard disk drives, can also be achieved under these specialised Clean Room conditions. NO FIX, NO FEE : no charge if your data cannot be recovered! to charge Fixed Rates for the recovery of your data irrespective of the cost & time it takes to recover. Door to Door collection & delivery all included in our fixed rates. To recover all recoverable data. Rapid Response: in order to get you back up and running with the shortest possible delay. To maintain the highest standard of work environment with the use of Clean rooms within all our laboratories, in which air quality complies with the applicable standards BS 5295, ISO 14644-4 and Federal Standard 209. Extensive experience and expertise in recovering data from ‘inaccessible’ hard drives. Data recovery from SCSI, RAIDs, SANs or NASs servers, Mirrored and Striped Volume, Exchange Servers, RAID or NAS servers, backup tapes, floppy diskettes, Zip, Optical Media. Complete discretion with regards to client data protection. A specialist team of RAID server qualified data recovery engineers. Free post-recovery customer services: providing you with measures to prevent similar losses in the future. Recovery (if the data is recoverable) solutions for data loss caused by power surges, software or system malfunction, lightening, fires, floods, sabotage, user errors, accidental format, deletion, repartitioning. A specialist team of forensic data recovery experts for litigation cases.